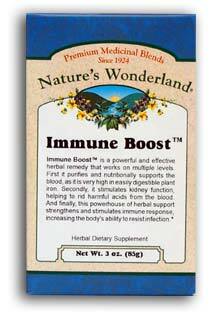 Immune Boost™ Tea, 3 oz (Nature's Wonderland) - Penn Herb Co. Ltd. Immune Boost™ works on multiple levels to fine-tune your defenses. The precise blend flushes toxins, supports healthy kidney function, and jump starts immune system function. And best of all, Immune Boost™ cleansing action promotes healthy looking skin! BURDOCK…nature's top blood purifier, is the herb of choice for promoting clear complexion. ECHINACEA…the popular immune tonic also calms irritated skin. Enhances immune system function, detoxifies; builds healthy blood; promotes healthy skin.